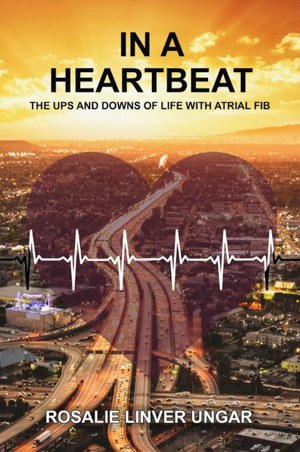 Rosalie Ungar is the author of IN A HEARTBEAT: The Ups & Downs of Life with Atrial Fib. Visit the Contact page if you have comments or questions for Rosalie, or if you would like to be a guest blogger. I like to think that my recent memoir, IN A HEARTBEAT: The Ups & Downs of Life with Atrial Fib, creates an awareness to new discoveries in the relationships to all forms of heart disease and other diseases of the body. Just the other day I read an article by Dr. John Barnard, President of the Research Institute of Nationwide Children’s Hospital in Columbus, Ohio. He writes that biological research shows that the immune system could influence a basic life function such as the heartbeat. Though, I realize that I am not a doctor, I have been reading and hearing about new connections between heart disease and other previously believed unrelated health issues. “I was hooked by the time I finished reading the first paragraph, as Ungar described her terrifying symptoms of a heart attack while addressing 25 men and women at a conference many miles from home.” Was the heart attack related to my atrial fib? “Finally a book written from a patient’s point of view.” From another patient. “….reads like an adventure story with mysteries, hurtles and purpose and is impossible to put down.” New research is creating new mysteries. “Atrial fibrillation is essentially an epidemic. This book truly comes ‘from the heart’ and is about the heart. Rosalie Ungar captures the complex issues that patients face, and shows that A-Fib can be disruptive to one’s life. She also shows that with a combination of the right physicians and a patient willing to partner with physicians, A-Fib can be controlled, and life can go on wonderfully well. I highly recommend this to any patient or family member of a patient dealing with A-Fib.” From a doctor! “The author’s personal experiences helped me know that I’m not alone. A must read. Thank you Rosalie Ungar for such a helpful book.” Support groups, such as Healing Hearts of Central Ohio, that educate patients while networking doctors, families, and patients. I strive to thrive and survive. It takes energy and attitude, neither of which happen without effort. Atrial Fibrillation was with me for 35 years. I’ve been free of it for almost 11 years. Read more reviews…all 5 star…on Amazon. This entry was posted in Blog on November 12, 2017 by Mark Layman.